McCarthy’s started life as a man and van service and is now proud to be the largest privately owned home removals company in Yorkshire. Tyrell was asked to provide online cost calculators for their removals service, which would enable visitors to receive an estimate to their email based on the details of their move (e.g. the distance to be moved and how much luggage they were planning on taking with them). Developed as a standalone WordPress plugin, the calculator includes its own admin pages for easy future alterations. The behind-the-scenes pricing formula can adapt to various levels of detail: whether the user wants to list each item they are moving or summarise by choosing a number of bedrooms, the calculator provides a quote to the chosen degree of accuracy. 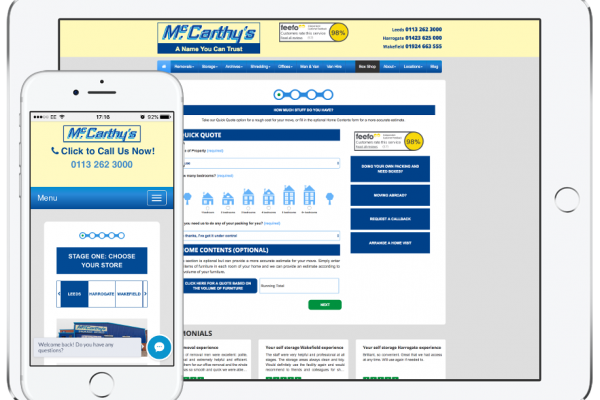 Through a built-in contact form, all enquiries through the calculator are also added to a database, allowing the McCarthy’s sales team to contact users and follow up on their enquiry. McCarthy’s have Self Store depots in Leeds, Harrogate and Wakefield and provide storage units for personal storage and business use. Tyrell were asked to provide a cost calculator for their website to enable visitors to receive a estimate to their email customised to their storage needs, as well as reserve a unit online. Developed as a standalone WordPress plugin, the calculator includes its own admin pages for easy future adaptation. The front end includes visualisations of each storage unit re-created in 3D to aid visitors in their selections, and a contact form allowing the McCarthy’s sales team to follow up on all enquiries made through the calculator.